I genuinely don’t think I have ever had a year as eventful as 2018. So many things have happened, and fortunately most for the positive! 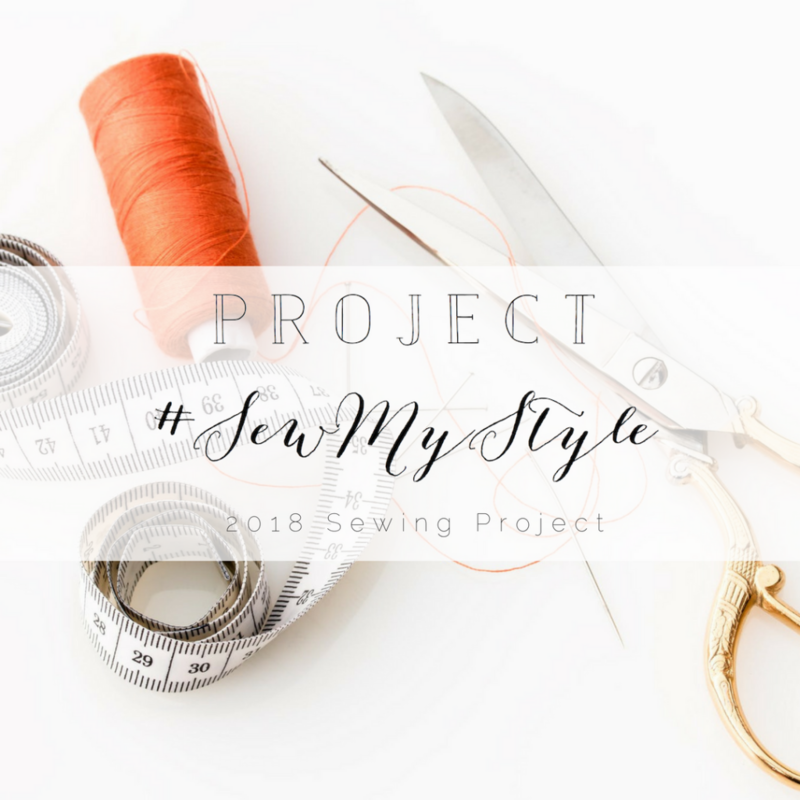 I started the year by becoming part of the Sew My Style leadership team. 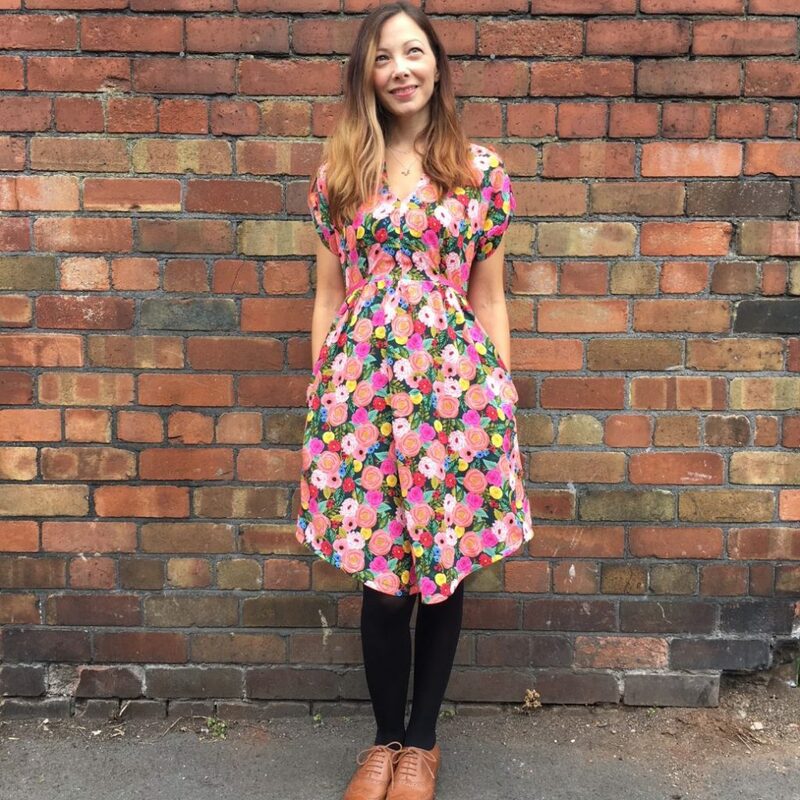 I was delighted to be picked for this and really enjoyed working behind the scenes to decide on patterns and liaise with the indie pattern designers and sponsors for each month. 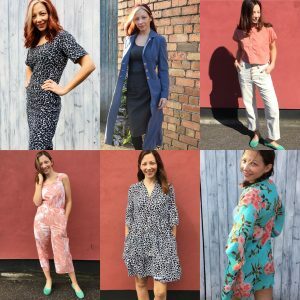 It was lovely to see how many people embraced the challenge and I ended up with a gorgeous little capsule wardrobe too! I was also asked to be an ambassador for the SMYLY (sewing makes you love yourself) challenge, organised by Athina, Lisa and Hattie. 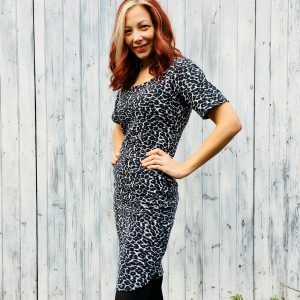 This involved making a garment that made me feel good about myself and sharing my story about how sewing helps me with body positivity and mental health. 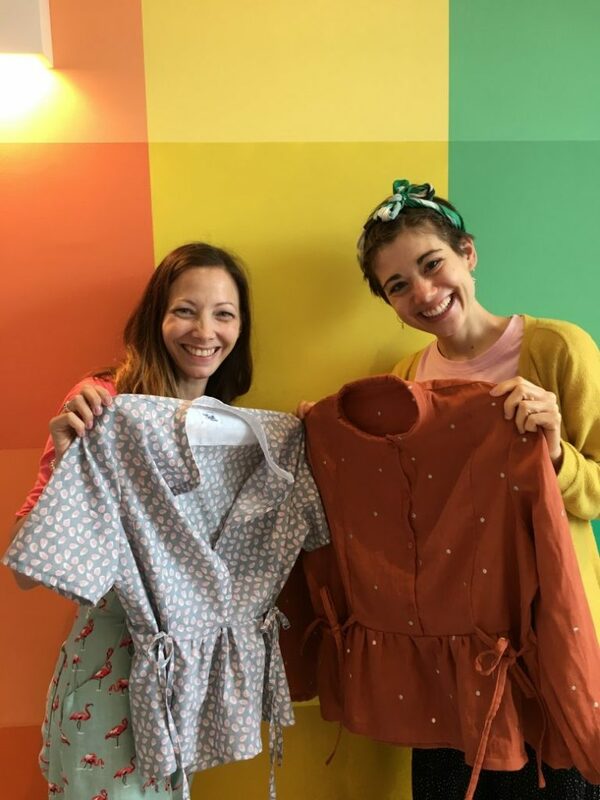 I was really proud to be an advocate for this challenge as I truly believe sewing has so many more benefits than just making pretty new clothes. 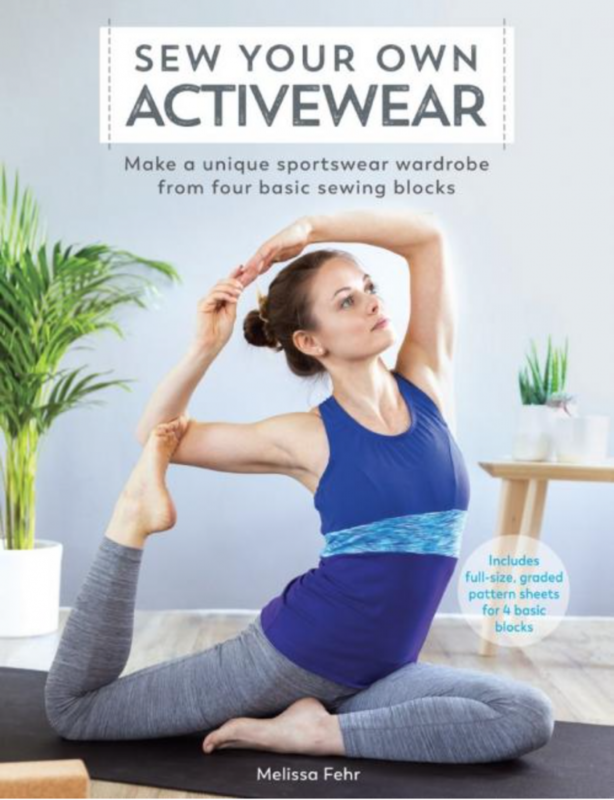 I was asked to be part of the blogger tour to celebrate the launch of Melissa Fehr’s Sew Your Own Activewear book. 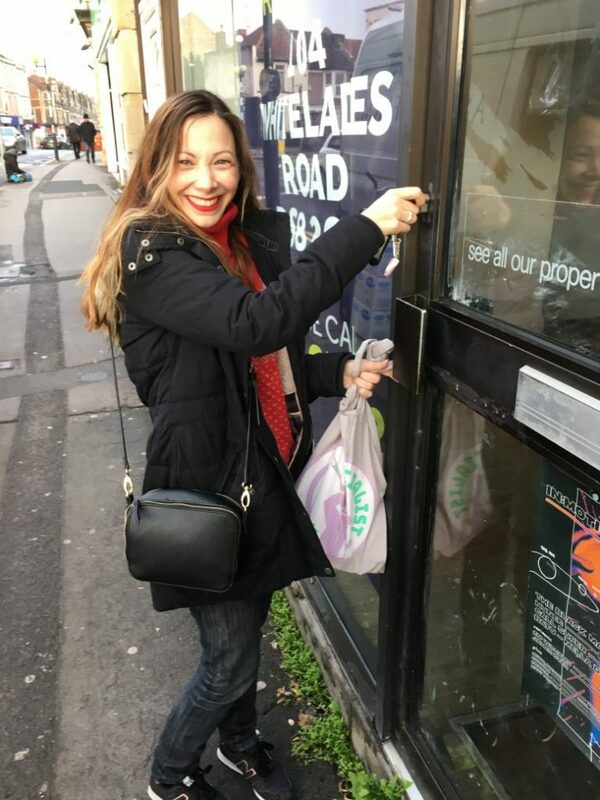 I made the yoga leggings from the book and wore them to Melissa’s book launch party in central London! 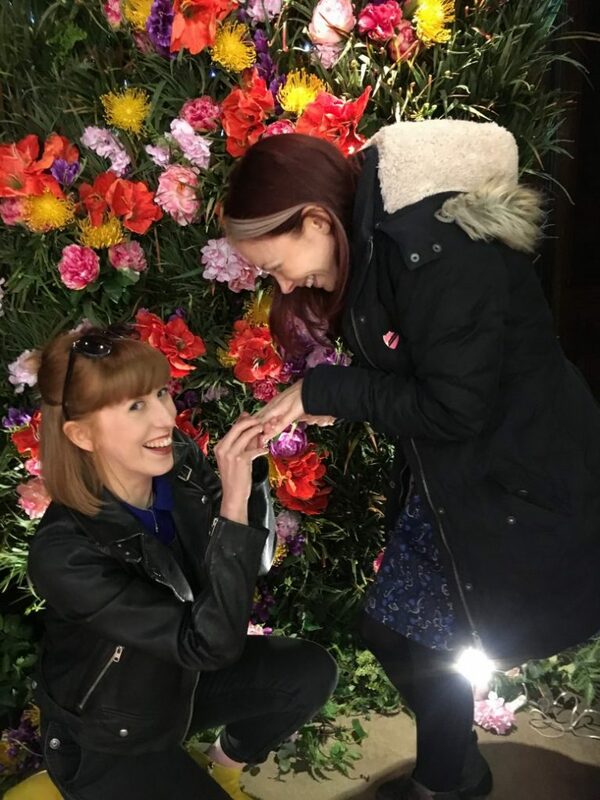 During a sewing meet up in London, I got myself a sewing wife! The gorgeous Jen from Gingerthread Girl and I decided to get Stitched (!) whilst at Liberty! 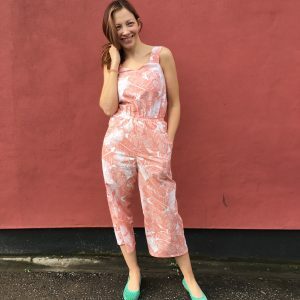 I joined the Simple Sew Blogger team as I thought it would be fun to give some of their patterns a try and it was also lovely to work with such a great group of sewing bloggers. Unfortunately, I only managed to make a couple of garments for them as the rest of my year got very busy! 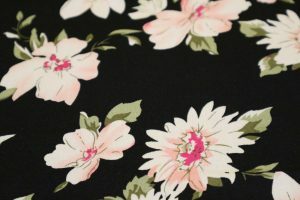 I took part in the MIYMarch18 photo challenge, which involved daily prompts related to sewing. I do love a good photo challenge as it helps me think creatively about my instagram feed and is also a great way to discover new sewists. 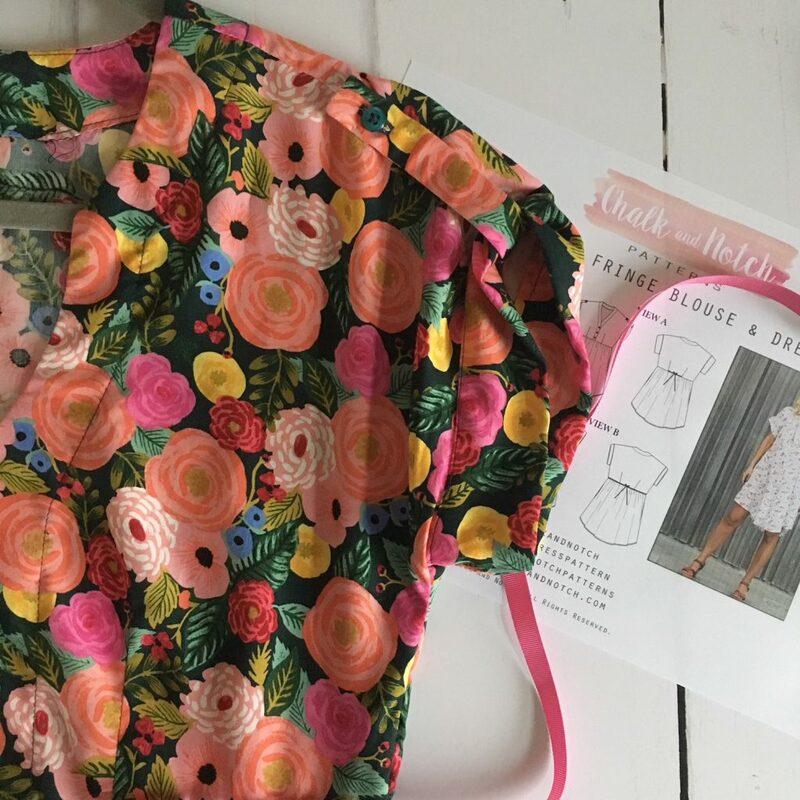 I took a week long pattern cutting course at Bath College to help me get a better understanding of pattern drafting and how to create and alter patterns. I really enjoyed it and would definitely like to continue to study this in the future. April was a huge month for me. After months of planning and deliberating, I left my corporate job that was making me pretty miserable and launched my own business! 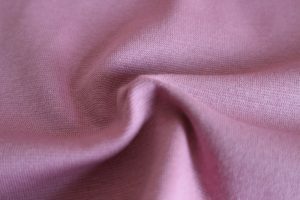 I had been contemplating making a career switch for a while and decided to make the leap and start my own online fabric shop. The shop launched on 7th April and I was absolutely thrilled with the response. The sewing community is so supportive and I couldn’t have dreamed how well it was received. 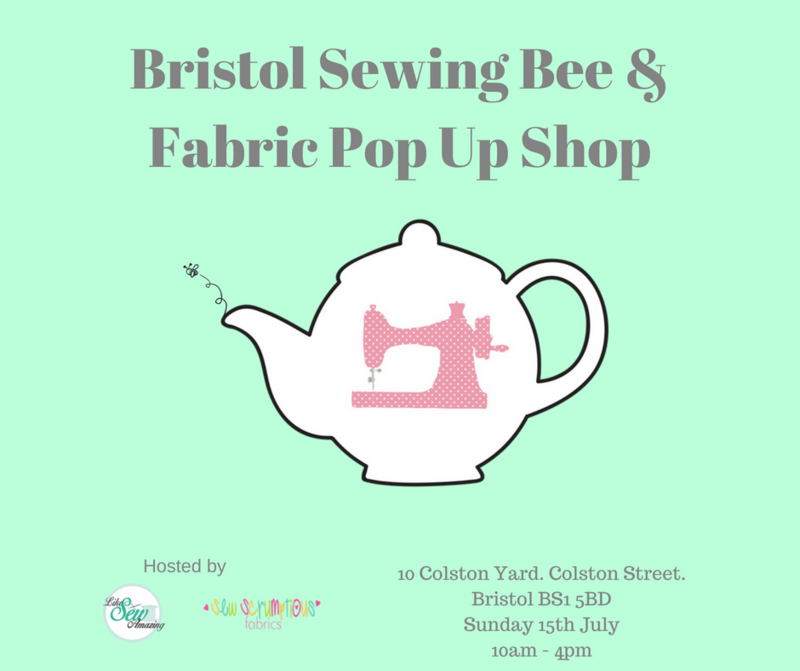 Along with the Stitch Sisters and Jen from Gingerella, we began planning a Bristol sewing event that would become the Sewcialite Soiree. 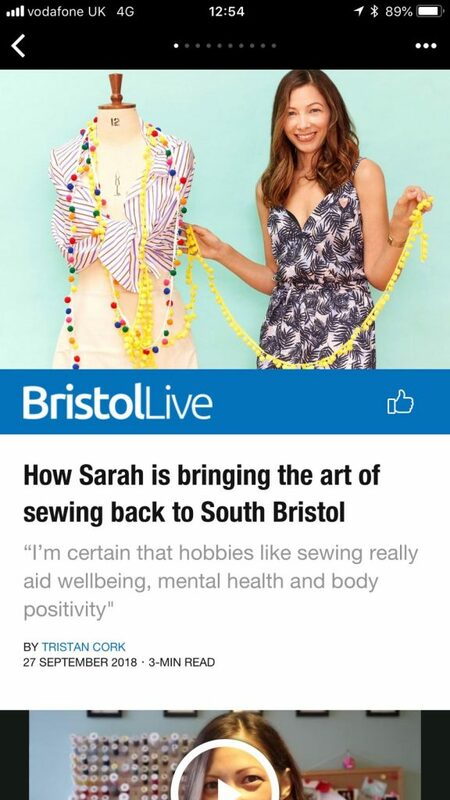 We really wanted to put Bristol on the sewing map and organise an event for the sewing community of the South West. The tickets sold in in just a couple of days too so we were really pleased with the response! 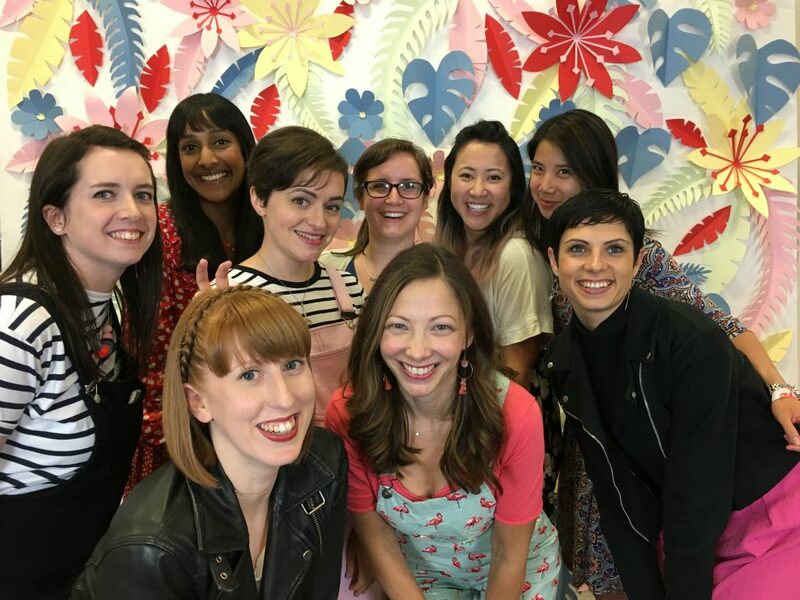 I put a call out for what would become the LSABlogSquad – a team of sewing bloggers to help me review fabrics and patterns for my shop. I was overwhelmed with the response and had such a difficult decision choosing the team but I am so pleased with the final line up. 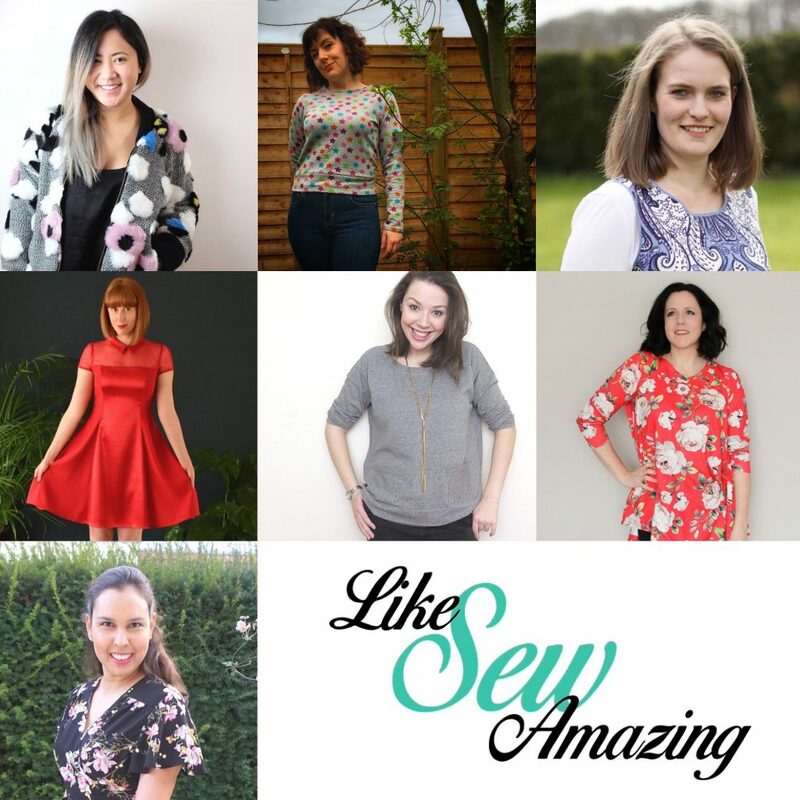 They have all helped me to create wonderful content for my blog, so a massive thank you to all the Jennys, Emily, Susie, Stef and Bianca! 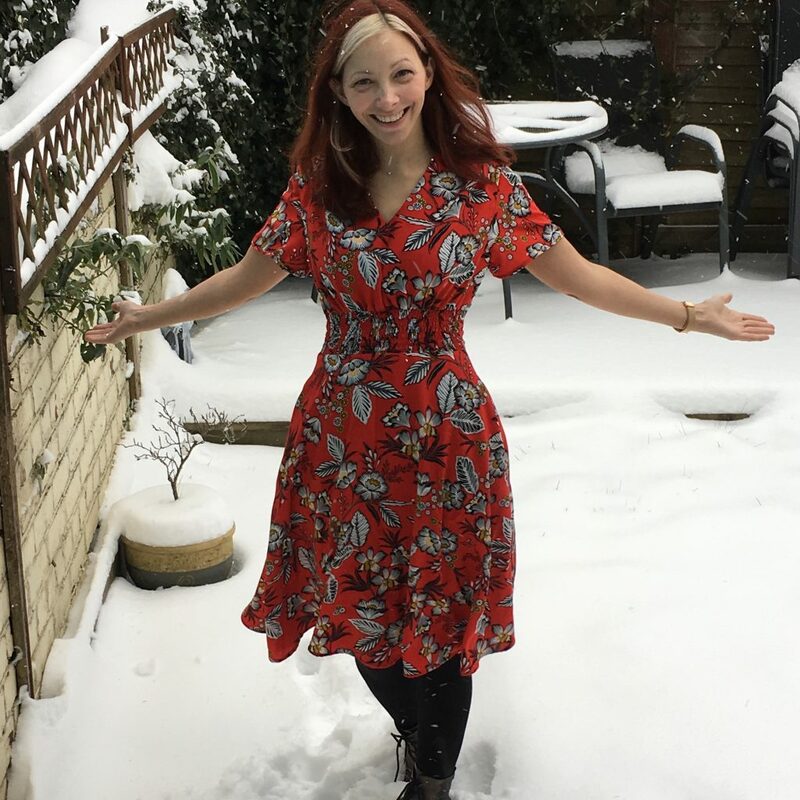 It wouldn’t be May without Me Made May – a photo challenge, run by the lovely Zoe from So Zoe… I love how you can make the challenge your own and pledge to take part in a way that suits you. I decided to use this challenge to help me identify gaps in my new non-corporate working wardrobe. I was thrilled to be asked to be an ambassador for this year’s Big Stitch Campaign, run by the British Heart Foundation. 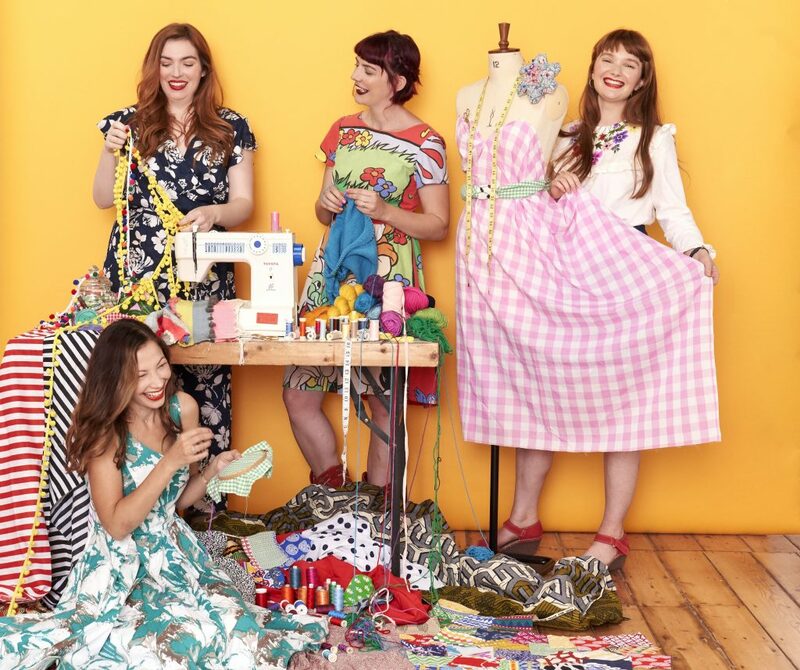 Along with a few of my gorgeous fellow sewing bloggers, Gabby, Alex and Rosa, we had a lovely photoshoot for the campaign which involved getting our hair and make up professionally done, by none other than Love Island’s Alexandra Cane! It was quite a surreal experience seeing my face pop up on Facebook as promotion for the campaign and I had so many messages from friends asking if it was me! I attended the blogging conference Blogtacular with a group of sewing blogger friends. It was quite an interesting event, as it wasn’t sewing related. I definitely learnt a lot from it and made some great new contacts. 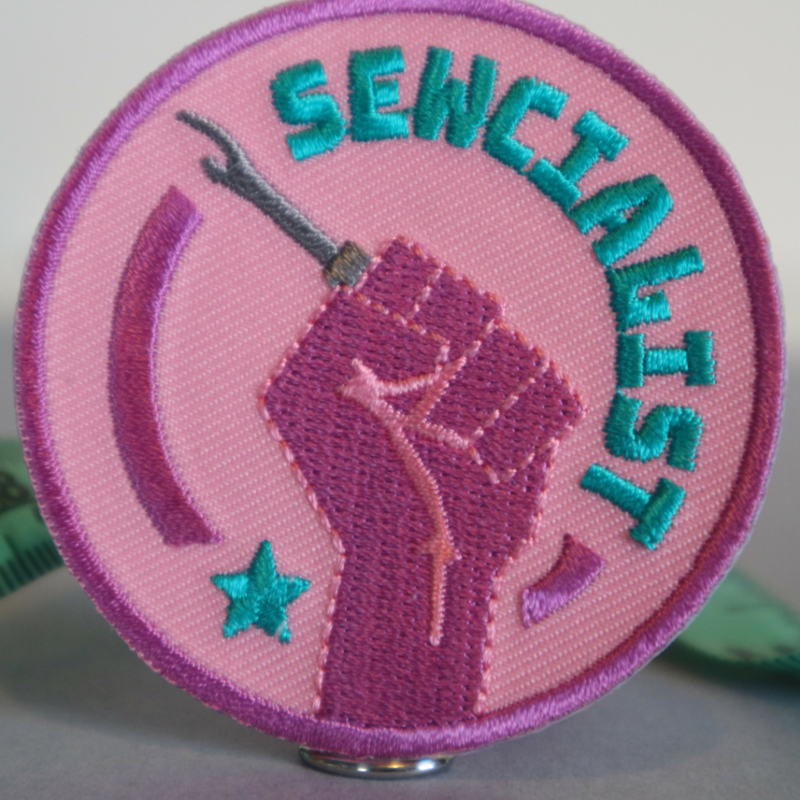 I was approached by a patch making company about working with them to create some “how to” videos for the products. We had a great time filming and I also worked with Aspinline to create my own range of patches, which I was really pleased with. I was super excited to be invited to be interviewed on the Stitchers Brew podcast. My episode was all about the world of pattern testing. 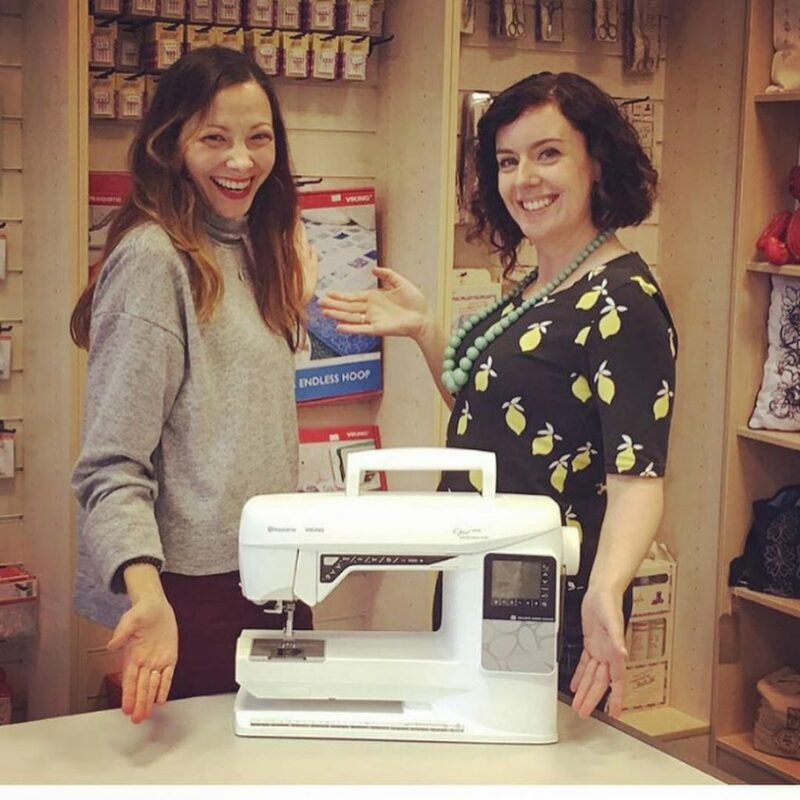 I was asked by the lovely Ana from Cocowawa Crafts to take part in a sewing day as part of the launch of her Honeycomb pattern. A group of us headed down to the Village Haberdashery for the day and all made our version of Ana’s pattern. Later that same day, I went along to the New Craft House Summer Party with some other sewing friends. It was great fun and a chance to meet up with some familiar faces! 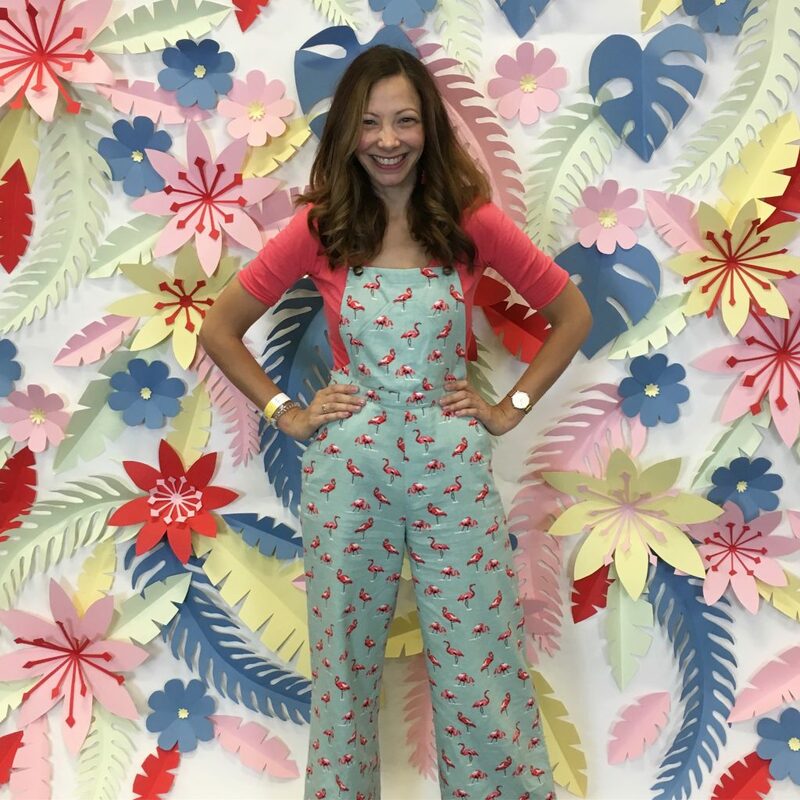 The theme of the evening was Tropical, so I gave my flamingo dungarees a good outing! July was a busy month as I was prepping for a pop up shop in Bristol. I had had a lot of feedback that people wanted to be able to come and see the fabric in real life so we tested the waters with our first pop up shop. It went so well and we were absolutely rushed off our feet all day! 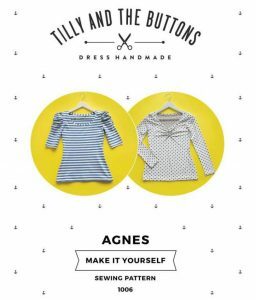 After mentioning how much I would love to be a pattern tester for Tilly and Buttons on the Stitchers Brew podcast, I was delighted to receive an email from them asking me to test their next two patterns. It was hard keeping them secret for the weeks between testing and release but I think we can all agree, the Ness and Nora patterns are gorgeous! With August, came the much anticipated Sewing Weekender event in Cambridge. I was lucky enough to get a ticket again this year and just had the best time hanging out with all my sewing friends. It was lovely that we managed to get nearly all of the blog squad in the same place at the same time! I can’t wait for next year! 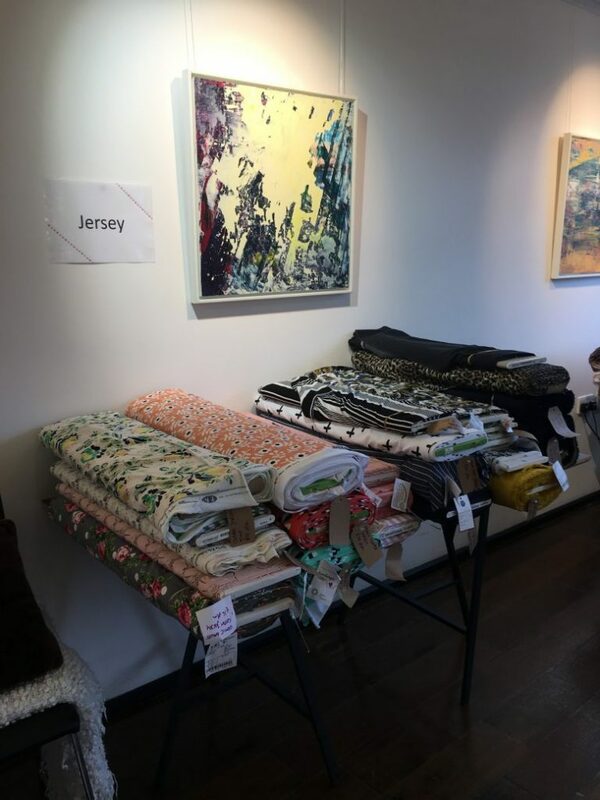 Following the success of the event in July, we held another pop up shop in September. We had more space and managed to get our processes much smoother this time around so it was a far calmer affair for Jenny and I to run. 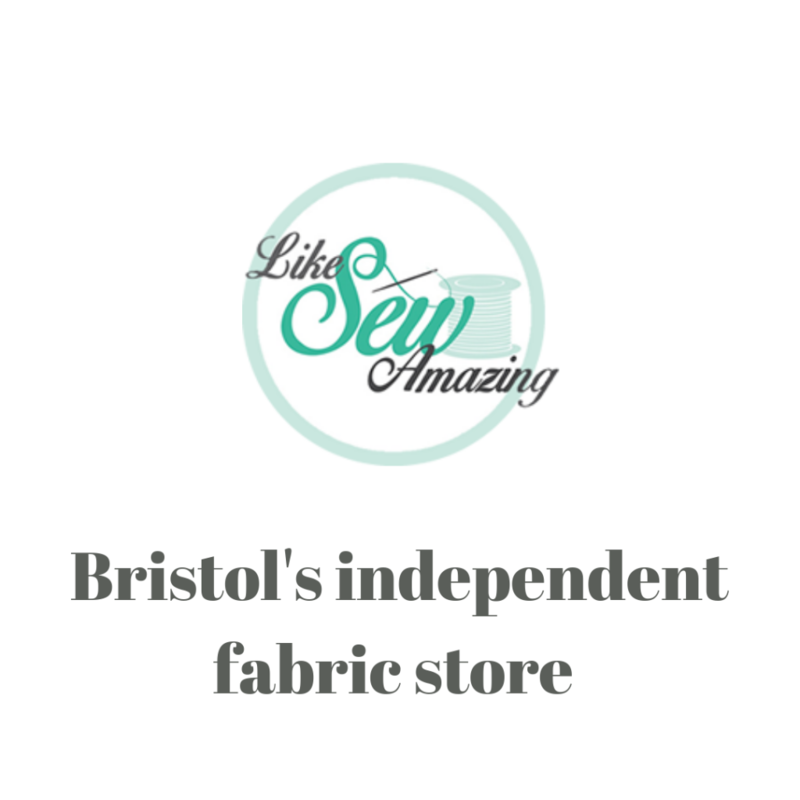 It was around this time that we had started to look for properties to start a bricks and mortar incarnation of Like Sew Amazing. We found the perfect space but then had several months of waiting ahead of us while the solicitors etc did their thing! Once we had found the right space, we knew we would need help to get it up together, so I launched a crowdfunding initiative on kickstarter. I was so overwhelmed with the response and how supportive everyone was. I used my marketing background to get as much publicity as possible and managed to get us in the local paper, and on the local radio and retweeted by our local MP! We hit the target and secured funding so then it was just a waiting game until we could get the keys. What’s been lovely about launching a sewing business is being able to support the various events within the sewing community. 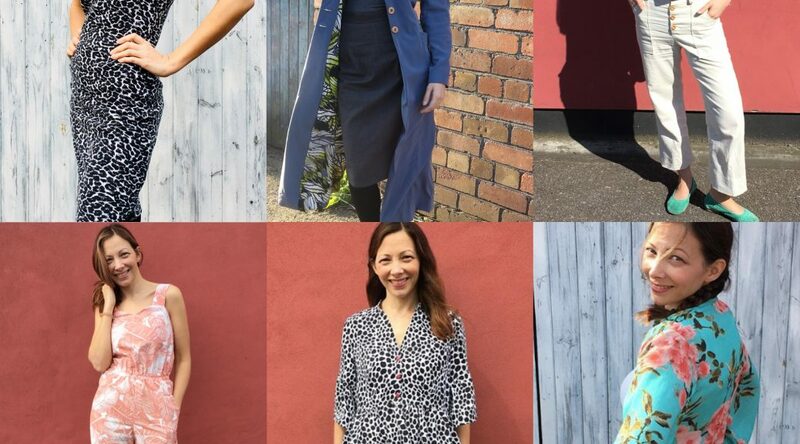 I sponsored lots of great challenges towards the end of this year, including the Little Red Dress Project, the Cosi Cardy Challenge and the Refashioners. 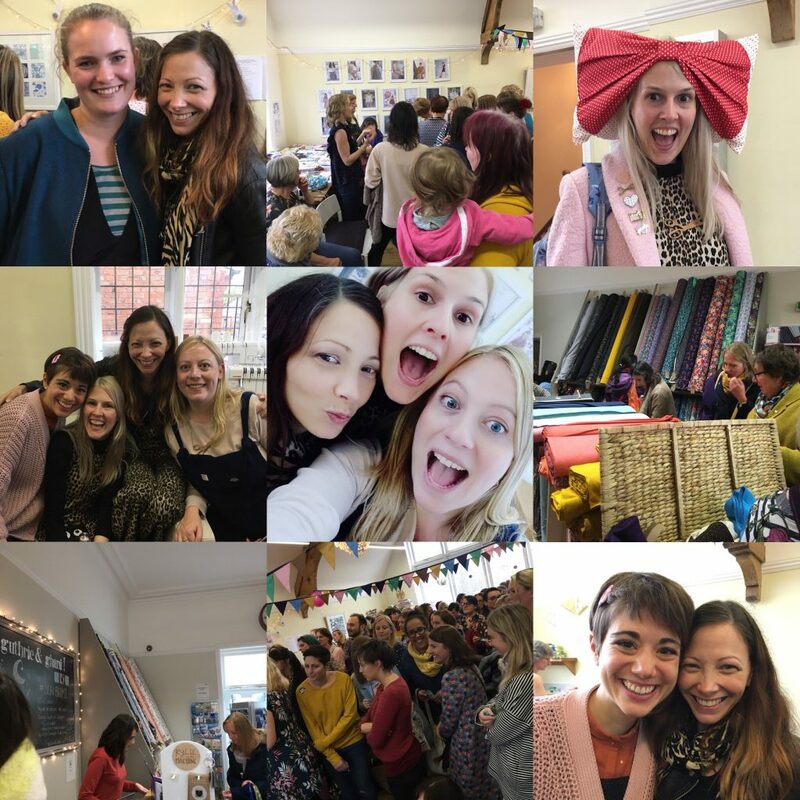 I wasn’t sure whether I was going to attend Sew Brum this year, as I was very busy at the time, but I’m so glad I did. 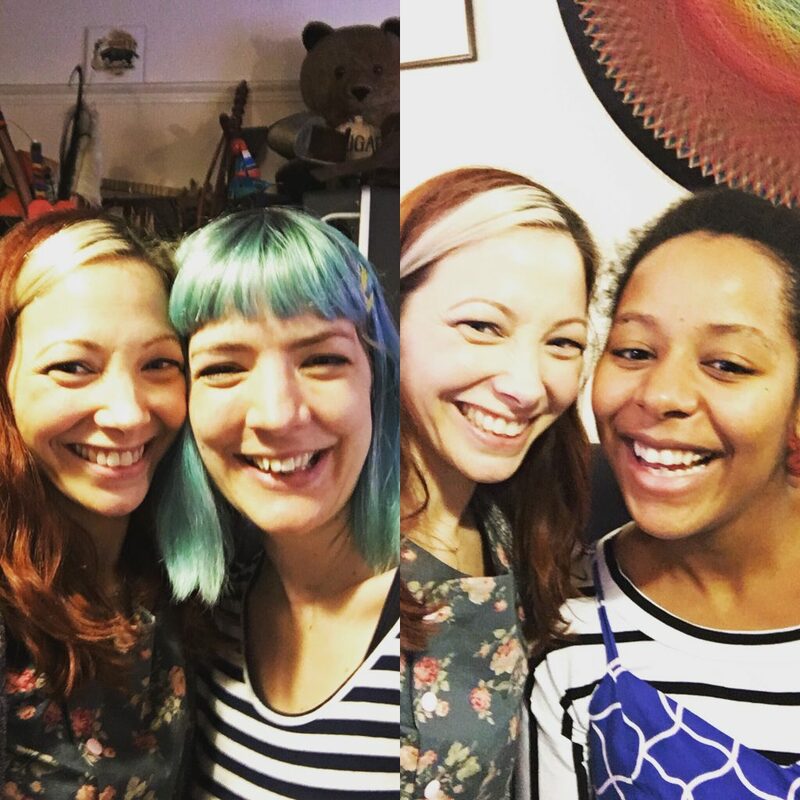 We had a lovely day of fabric browsing/buying, a big old trip to pizza express and a lot of talking about sewing! In November, I partnered with Husqvarna Viking as a brand ambassador. I am delighted to be working with them and they are going to be providing lots of amazing machines for the shop. We will also be a reseller for Husqvarna, once we are up and running. 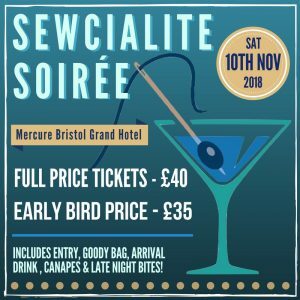 We held the Sewcialite Soiree in November. It took months of organising but I was so pleased with how the event turned out. We held an afternoon tea beforehand so that people could get to know each other in a quieter setting and then we held the party at a lovely hotel in the city centre. We had good food, good music and lots of dancing! 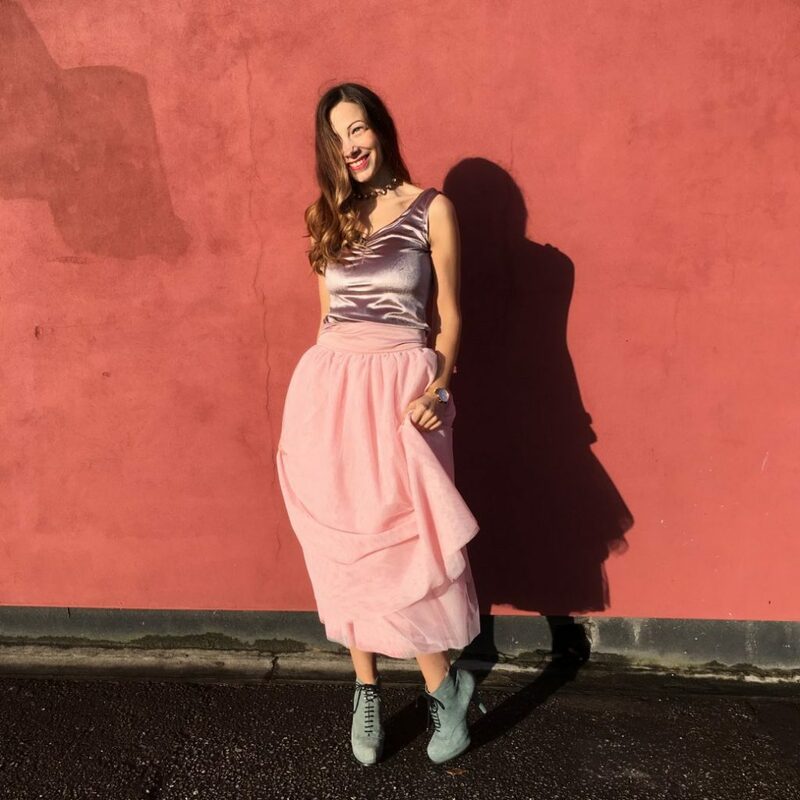 I made a Carrie Bradshaw/ballerina inspired outfit for the event, which was a real labour of love and kept me busy for a couple of weeks! 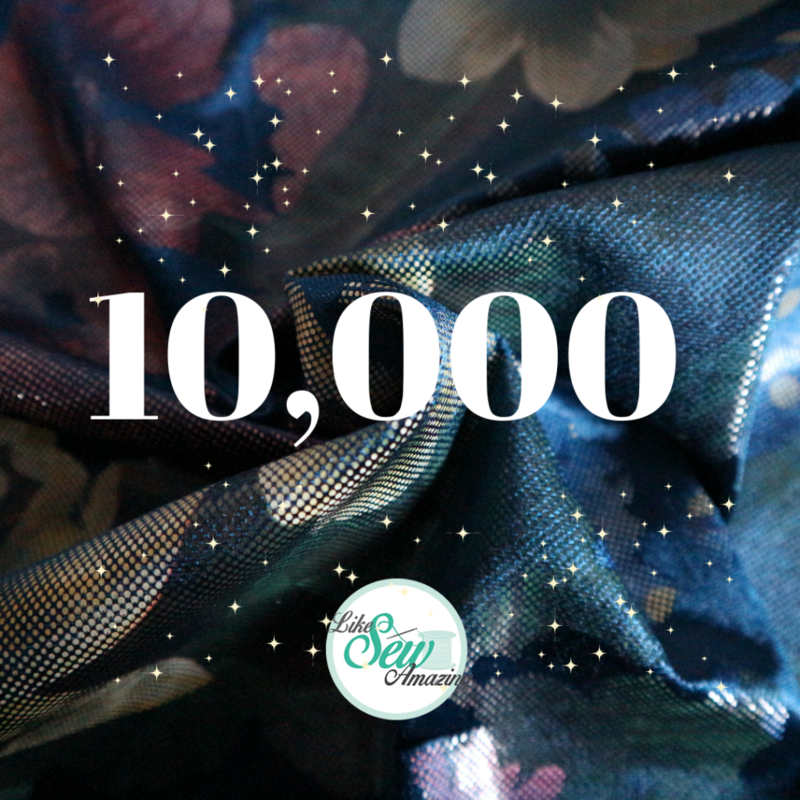 I hit the magic 10,000 followers on Instagram in November, which was so lovely. I am extremely grateful for the amazing, supportive community that we have and am so pleased that my business is resonating with people. So despite being plagued with a never ending cold, December was perhaps the most exciting month of all, as I finally signed contracts and got the keys to the shop! Such a fab Christmas present! We’ve already been in and had a big clean up in there with some wonderful friends who gave up their time to help. We’ve started decorating and getting it all up together and the current plan is to be open by the end of January! I’m so excited for the shop to open. There will of course be a launch party, which I hope lots of you can make. We will also publish our workshop schedule very soon so we can start taking bookings. I am so eternally grateful for the support I have received from my partner, family and lovely friends in the sewing community. Particular shout out goes to Jenny, who I am so excited to be working with. It has been a year of real surprises and I would never have thought I would be where I am now, if you had asked me a year ago! It has definitely been a year of being brave and jumping in and long may that continue! There is a lot of hard work ahead to get ready for opening but I am so excited at the prospect of whats to come in 2019. I really hope you can all come and visit! Wishing you all the best for a happy and healthy New Year. Honesty time, I have to admit, I was a little unsure about the Fringe dress. 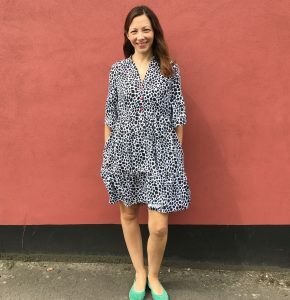 I thought it was very similar to both the Honeycomb and Myosotis dress that I have recently made and I didn’t think there were any gaps in my wardrobe for this pattern. 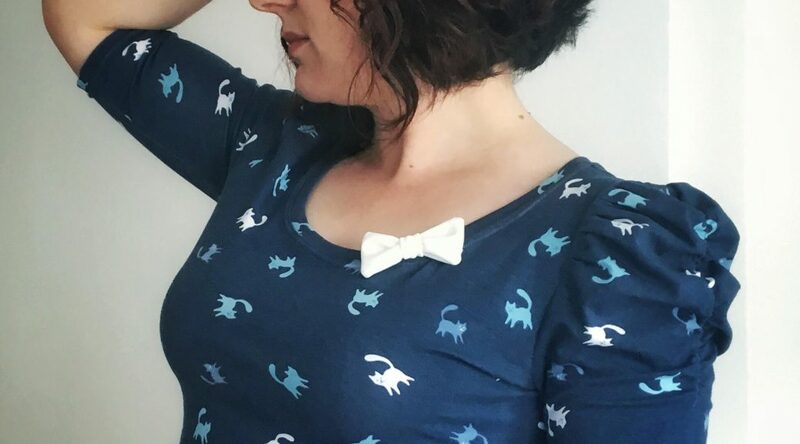 Had it not been for Sew My Style, this pattern would have passed me by, but being on the leadership team, and my need to complete tasks meant that I jumped right in this weekend and got it made! 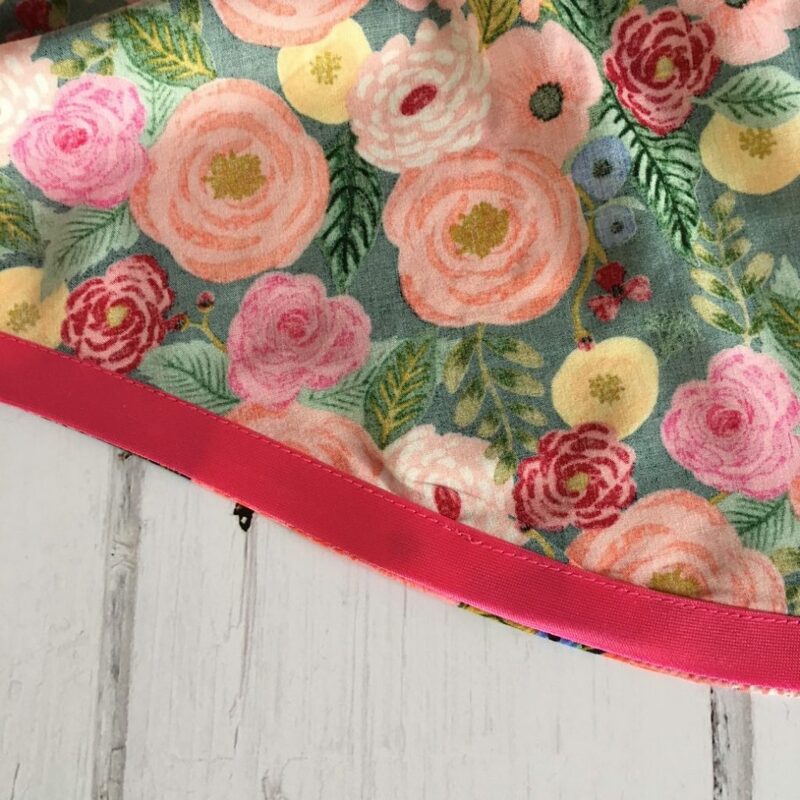 Having seen some beautiful versions on Instagram using Cotton and Steel rayons, I decided that it would pair perfectly with the new Juliet Rose rayon from the Rifle Paper Co collection. There is a cream colourway, but I chose to use the navy so that I can carry on wearing it in the winter with tights. 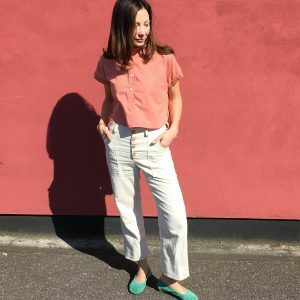 Having made an Ogden cami from one of the other Cotton and Steel rayons, I had no qualms about using it as it is such a dream to work with – none of the usual slipperiness that rayons are known for and it washes and presses beautifully. 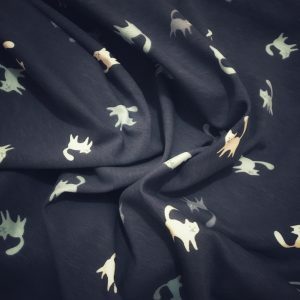 And as a special offer, you can save 10% off both the cream and navy versions of this fabric until Friday 14th Sept by entering the code ROMEO at checkout! I decided to take a little of version A and a little of version B. 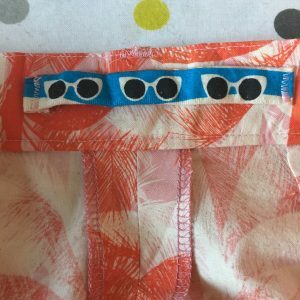 Having made the Myosotis, I thought the buttons of version A were too similar so I opted for the shaped front of version B instead but I kept the sleeve tabs and added some little green buttons on the shouders. 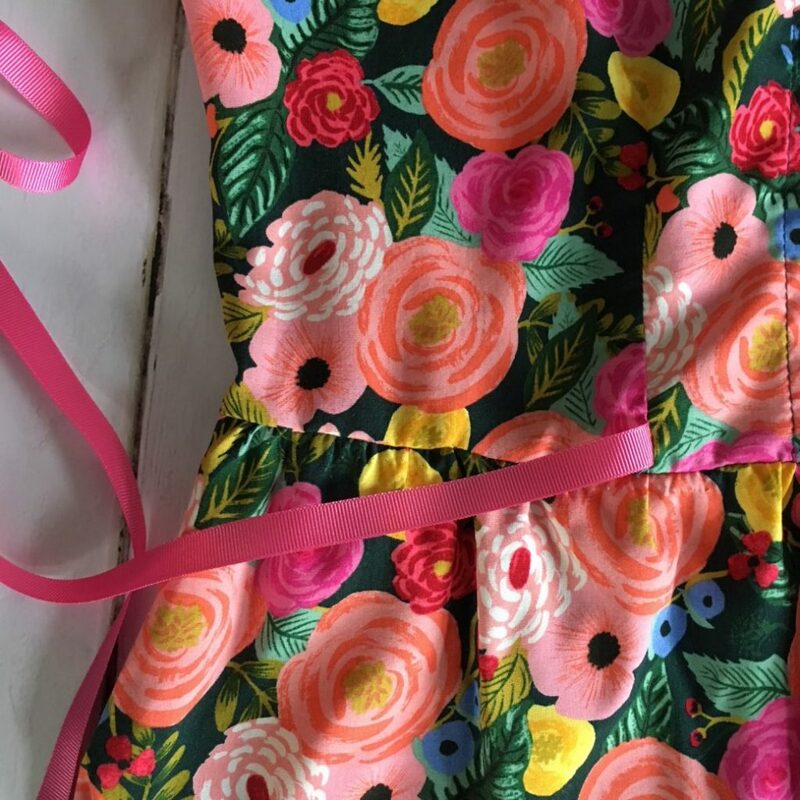 I added the waist ties as I do prefer a more cinched in silhouette, but I chose to use a matching pink grosgrain ribbon to add some pretty detail. I added mine into the front darts (such a clever idea) and I think it work really nicely. Construction-wise, it is all pretty easy. Perhaps a less well behaved rayon wouldn’t cope so well with having the neckline facing being topstitched down, as it tends to shift, but this worked really well. I obviously added the pockets to mine – surely that is a given by now! I also liked the unhemmed length when I tried it on, so I chose to finish the hem with bias binding, which meant I didn’t have to turn it up so much. 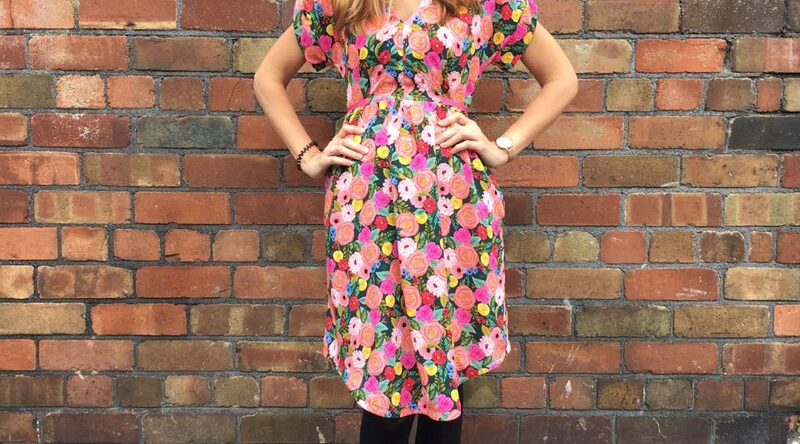 I also really like that the dipped hem means you can see a little flash of the pink trim on the sides as you move! 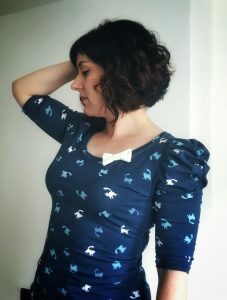 Overall, I am so pleased that I did take the plunge and make this dress. 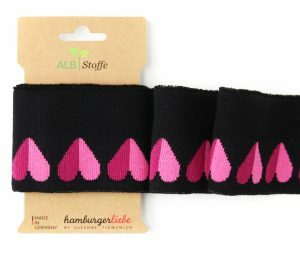 I can see it becoming one of my favourites to wear out and about – it is a joyful riot of colour and I really love the shape. 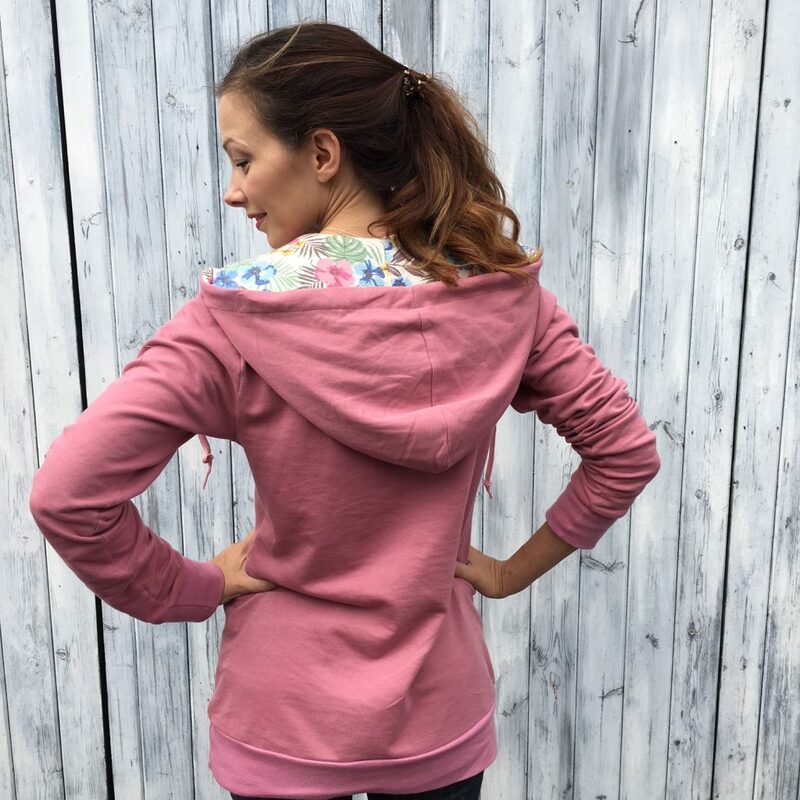 I was really excited to make the Halifax Hoodie by Hey June as I wear hoodies all the time and hadn’t made one yet. I love how many variations there are with this pattern. I chose to make version a, which is a longer length with a kangaroo pocket and hood. 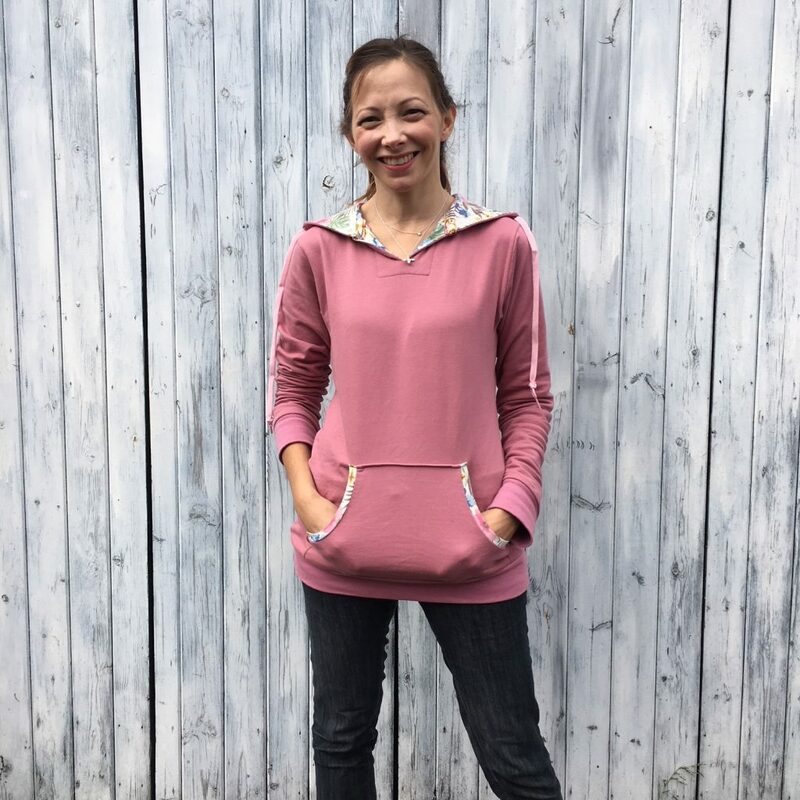 I used this gorgeously soft and cosy fleece backed French Terry for the main garment, and teamed it with the matching ribbing for the cuffs and hem band. I then used this pretty linen/viscose knit for the hood lining and pocket bindings. Even though it took me ages to finally decide on a combination, I’m glad I took the time to get it right as I couldn’t be more pleased with how well the fabrics go together. The construction of the sweater was pretty straightforward and didn’t take long at all. I did note the lack of notches and I think that this pattern is not particularly beginner friendly because of this. The instructions for variations such as lining the hood are quite sparse, so would require some sewing knowledge too. 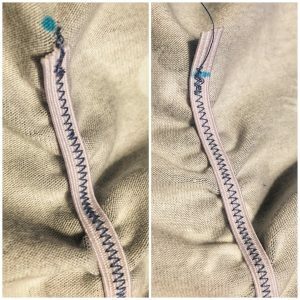 Having struggled through creating buttonholes on knit fabrics before, I noted that my machine has a stretch buttonhole option and I was delighted to find that this worked perfectly! I used some bootlaces for the drawstring – a length of 140cm works well. The only thing I found a bit odd is the placement of the buttonholes for the drawstring – they seem far too high up on the hood. I think the sizing is pretty spot on and I would definitely make this pattern again. I would love to make one of the funnel neck versions next. 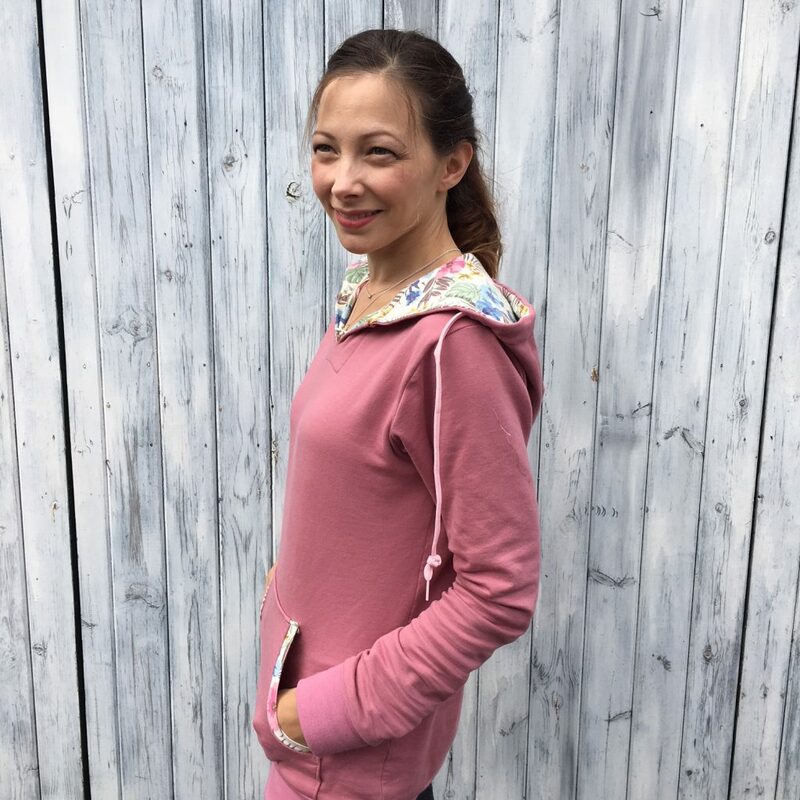 The Halifax Hoodie by Hey June Handmade is the Sew My Style pattern for August. 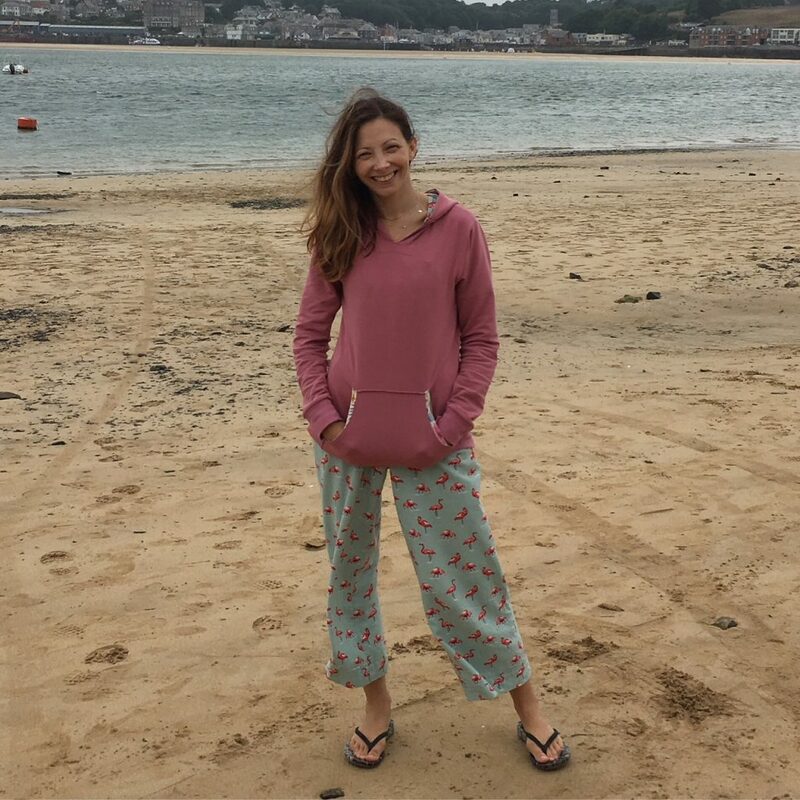 Even though we are having one of the best summers in the recent past in the UK, it is still always nice to have something cosy for cooler evenings and this will be great as we transition into Autumn/Winter. There are several options for customising your Halifax and depending on your fabric choice, you will get a differing looks. 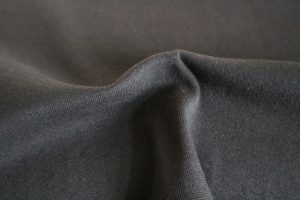 You can also use a cotton jersey to make your Halifax, as long as it is a medium weight. 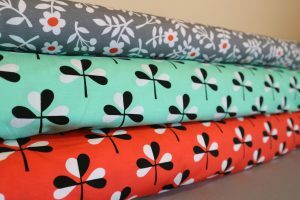 Why not mix up some of the gorgeous Albstoffe organic cotton jerseys? 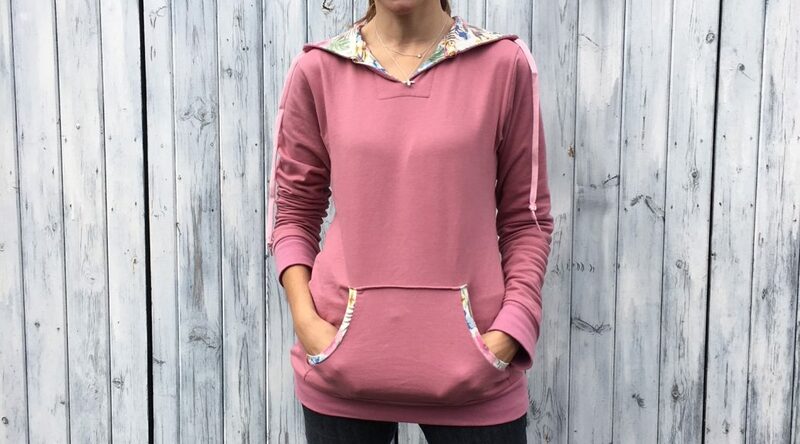 Of course, hoodies don’t have to be completely casual, you can opt to use a velour to add a touch of glamour! 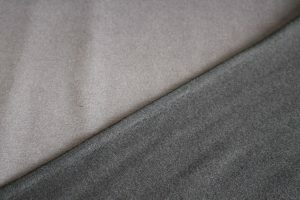 You can also choose to use a contrasting fabric for your hood lining – you can use any lighter weight jersey for this. I hope this gave you some good ideas for fabric choices. I can’t wait to get started on mine! I had already made a pair of cropped Lander pants from linen earlier in the year but I really fancied making the shorts version. I had got the fit spot on with the trousers so knew what I needed to do for the shorts version. 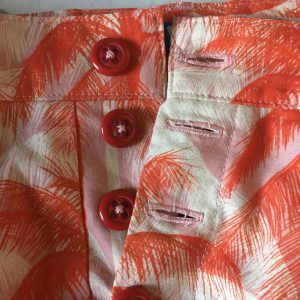 I was going to make the shorts from some black linen for a chic look, however, as we have been having such a lovely summer in the UK and I’ve been wearing lots of colour lately, I changed my mind and opted for this gorgeous tropical themed Palms Peach cotton by Cotton and Steel. 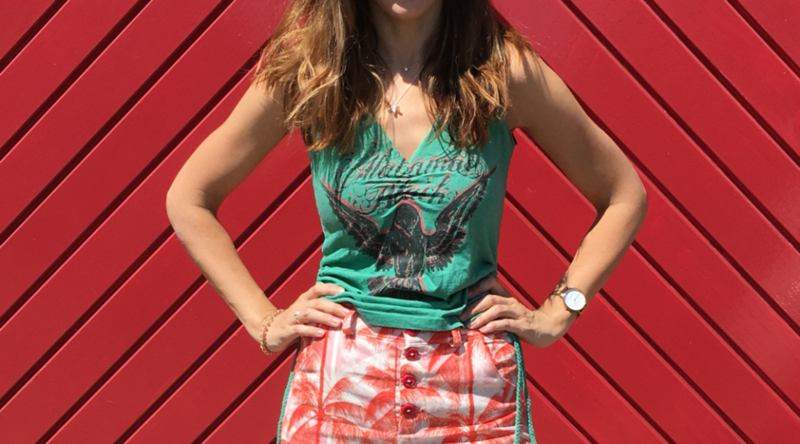 I think the colours are so stunning and it really gives the shorts a great summer vibe. 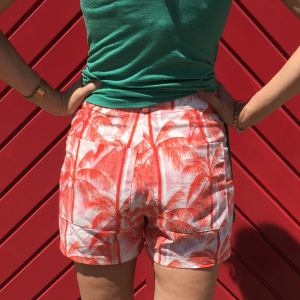 I lined the shorts with some scraps of the flamingo linen that I made my Jenny Overalls from, to continue the tropical theme! The adjustments I made were to take out half an inch from the centre back seam graduating to the normal 5/8 inch seam allowance at the back notch. I then just cut a really long waistband so that I could cut it down to size to fit the trousers. I decided to go for the inside front pockets. I had seen that Kelly from True Bias had posted this hack on her blog and thought it looked good. I wasn’t especially keen on trying to pattern match this busy print so this was a good alternative! I think it works really well and would definitely use this finish again. I used some large red buttons from my stash and I think they look really good against the fabric. As with my latest Carnaby dress, I used the cute Cotton and Steel selvedge as a label on the inside of the waistband. I used these gorgeous sunglasses for some cute detail! 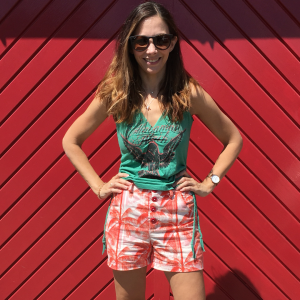 I love the length and fit of the shorts – they fit so well and don’t feel too short! I will definitely make another pair now that the fit is spot on. Maybe a denim pair next? 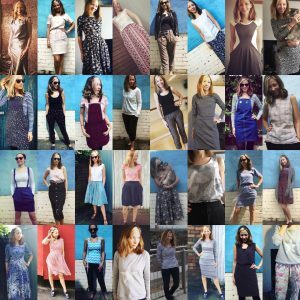 So we are now halfway through the year and halfway through the Sew My Style challenge and isn’t this year just whizzing past? I thought I would do a little round up of my thoughts on the challenge so far. While I was pleased with my finished Sunny dress, it hasn’t really had that much wear. 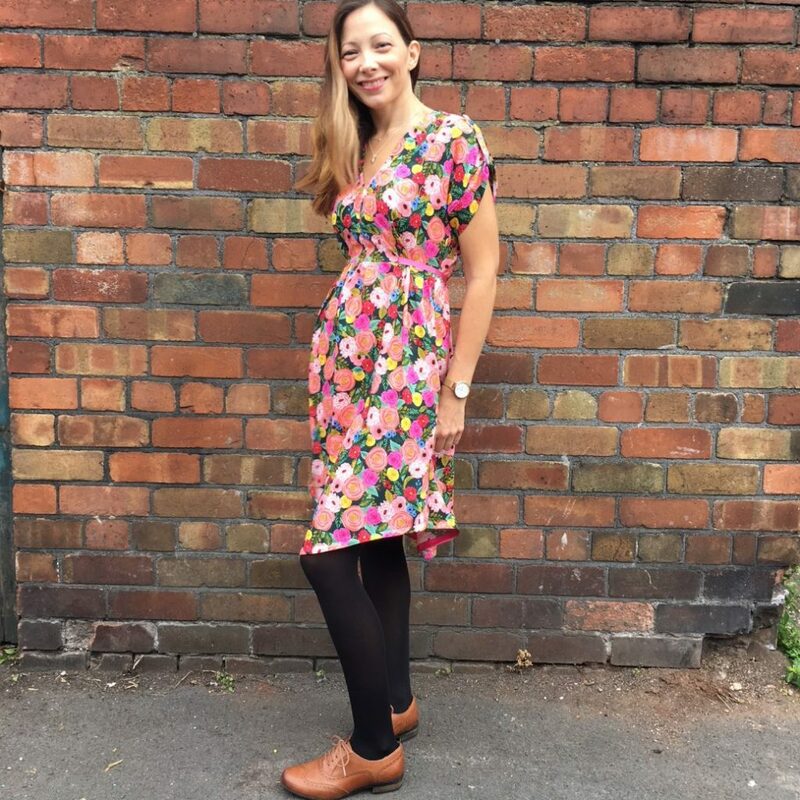 Although it is a really easy dress to throw on over tights if you need to look put together, without really spending any effort in reality! I think I was never really happy with the fit of the sleeves but I still really love that curved hemline. Not a total fail but not the biggest win either! The Rumana coat was a real labour of love. It was definitely not a speedy make and involved a lot of cutting out on the floor, due to the length of some of the pattern pieces. I am really glad I kept mine at the longer length – I think it gives it a lovely silhouette. 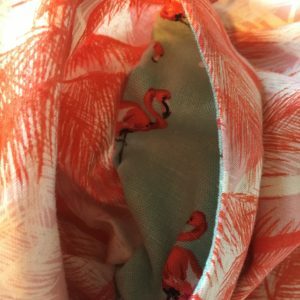 I chose to make mine from a cupro, which meant that I did have to make some adjustments to the pattern to allow for a lighter weight fabric. I really love the bright flash of contrasting lining. 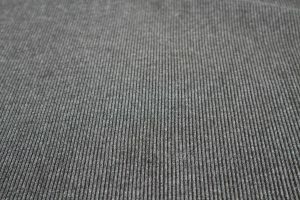 I will definitely make this pattern again from a wool blend so that I have a chic winter coat. This has to be one of my favourite makes of this year so far! 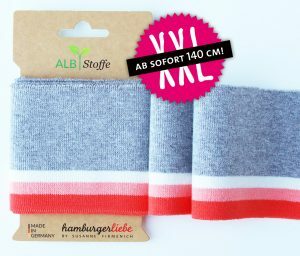 I love the combination of this fabric for the cropped version of the Kalle. I have worn this a lot already and keep finding new things to pair it with. 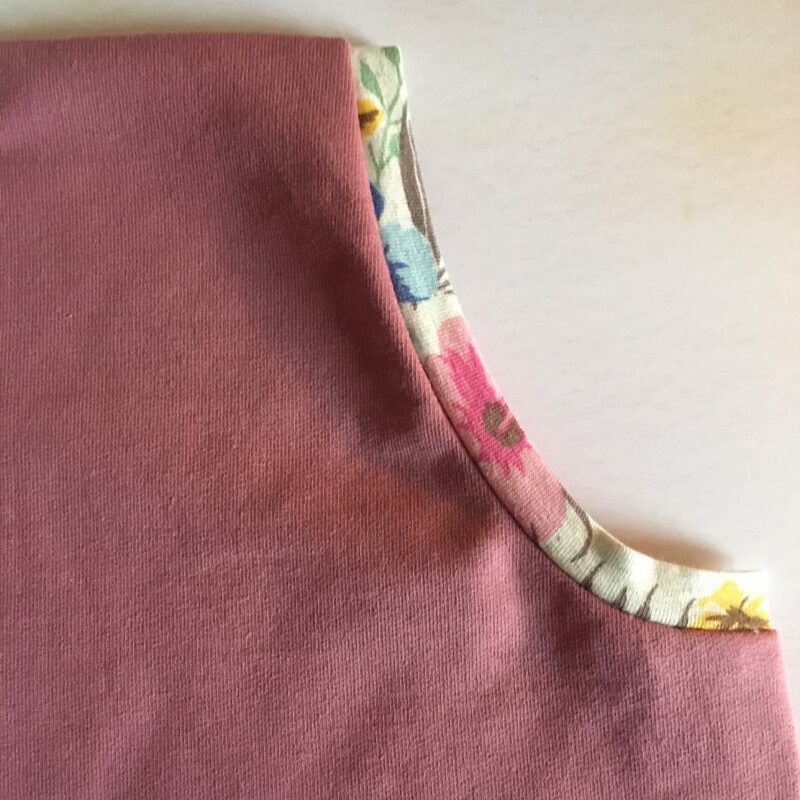 I made the popover placket and used some cute heart shaped Prym snaps for closures. I also used a contrasting Liberty fabric for the inner yoke and collar band. 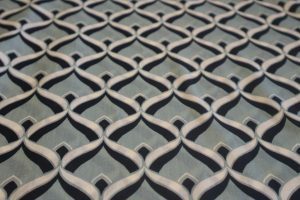 I think this is a super versatile pattern with so many different options for customisation – who could ever get bored with it?! I had to make some adaptions to the Marigold pattern to make it something I was happy with and that I felt would suit me. I changed the trousers to a wider leg culotte and also fully lined the bodice. I am pleased with the finished garment, however, I haven’t really worn it yet as the fabric is a teeny bit sheer and I feel it would be better suited to being worn on holiday, although with the impending heatwave in the UK, this might see some action this week! I really wasn’t that sold on the Myosotis when I first saw the line drawings. I decided to go all in though and make my version with all of the ruffles but I made it from a super floaty viscose so that it wasn’t boxy on me. I actually ended up really loving this dress so much and have worn it so many times already. It was a pretty quick and easy make and I will definitely make another. 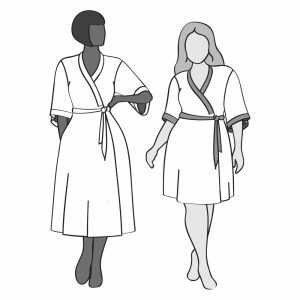 As much as I love the dressing gown/robe versions of the Suki, I was really keen to make the daytime cover up hack version that Helen had done on her blog. I love the look of a kimono over a vest and jeans/shorts so this was the one for me. My only issue was choosing between all the lovely fabrics. 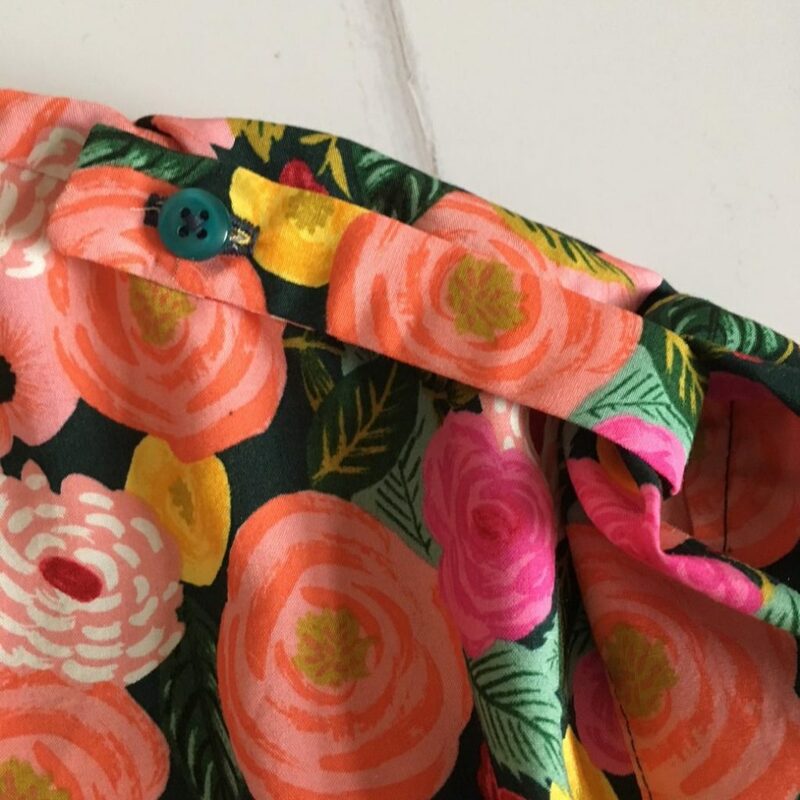 I am really pleased with the fabric that I did choose in the end – it is so bright and colourful and the kimono pattern really shows off the fabric. It’s quite interesting looking at the six garment so far as a collection. 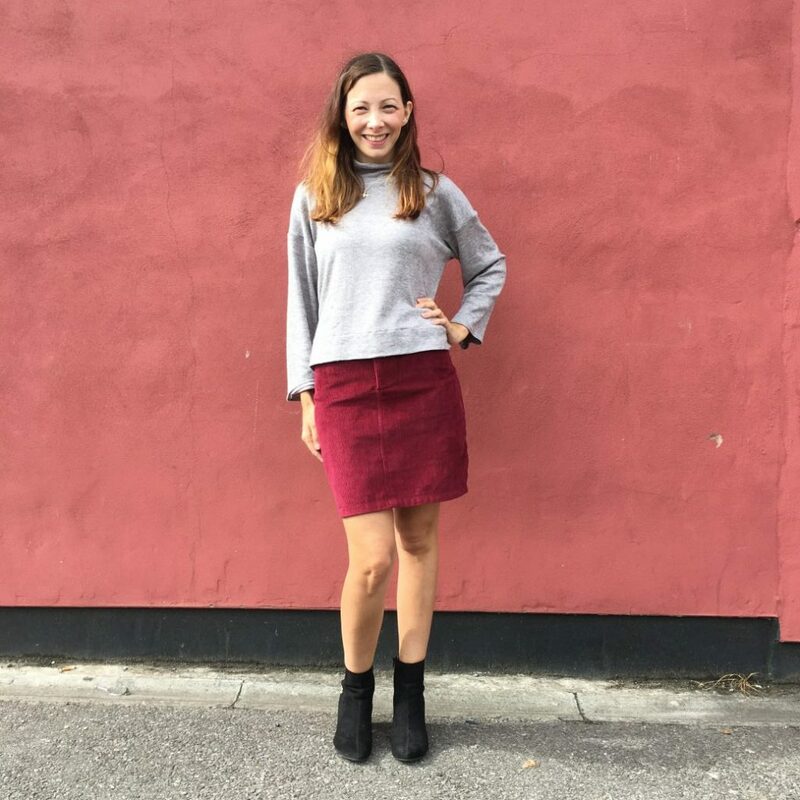 Quite subconsciously, I have picked a palette that goes really well together so there are definitely possibilities for items to be worn together and mixed and matched. The July pattern is the Lander pants and I may have already made a pair as I just couldn’t wait. They already fit nicely into this capsule collection so I am really pleased with how it is going so far! 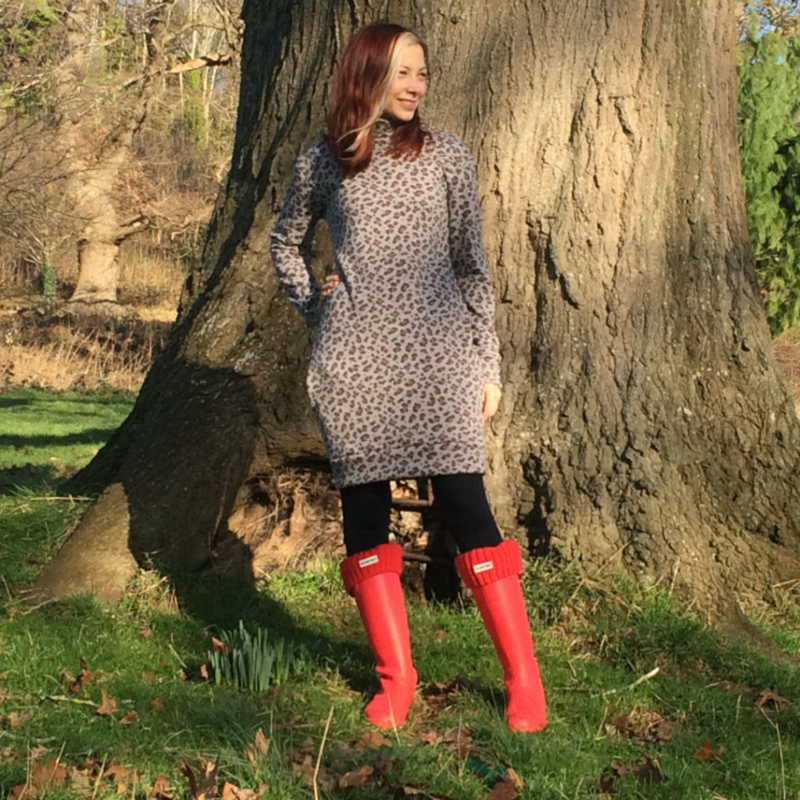 It’s not too late to join in with the challenge – visit my post here for details on how to sign up to take advantage of the discounted patterns. June’s Sew My Style Pattern is the Suki Kimono by Helen’s Closet. I’ve been looking forward to making this one for a while and it is on my 2018 Make Nine list too so it’s been good to get this one made. 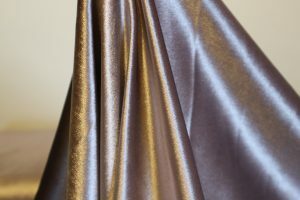 I recently posted about all of the lovely drapey fabrics that I had recently got into the shop, and it meant I had quite the dilemma when honing in on which fabric to choose for my Suki. In the end I narrowed it down to this gorgeous turquoise viscose Lady McElroy fabric called Blossom Reflections. I think the Japanese style and colour combination are perfect for a kimono. I decided to make mine as more of a daytime cover up, rather than a robe, as I don’t already have anything of that nature in my wardrobe. 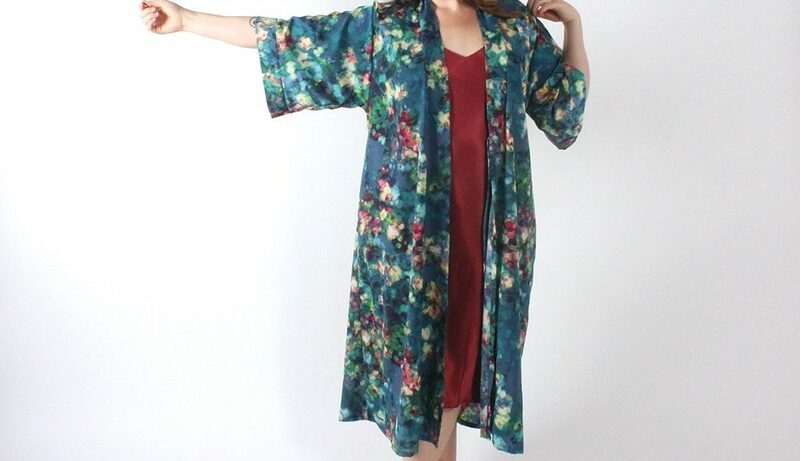 I also love the look of a kimono worn over a vest and jeans or shorts. 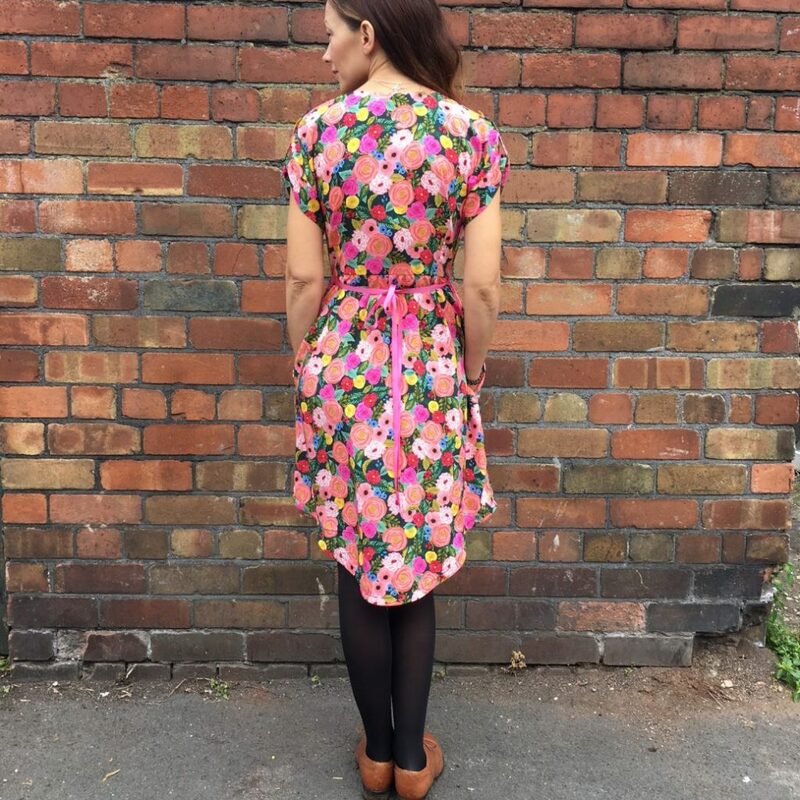 I used the hack on Helen’s blog to transform the original pattern into the cover up. It basically involves straightening out and narrowing the front pattern piece and extending the front band to full length. It all came together pretty quickly, with only a couple of minor errors on my part. Namely, I didn’t see that the sleeve pattern piece wasn’t unfolded completely so I had to go back and recut them! Also, I didn’t lengthen the front band piece enough so had to shorten the kimono, but I am actually pleased with the finished length so it’s all good! The only slight flaw in my plan was that it meant that the pockets hung down a little at times, so I fixed that by securing them to the front band seam allowance. Overall, I am really pleased with it and hope to get a lot of wear out of it this summer. I would like to and make the dressing gown version at some point, but I’m going to try and find a lovely silk for that. I’m really looking forward to seeing everyone else’s versions! 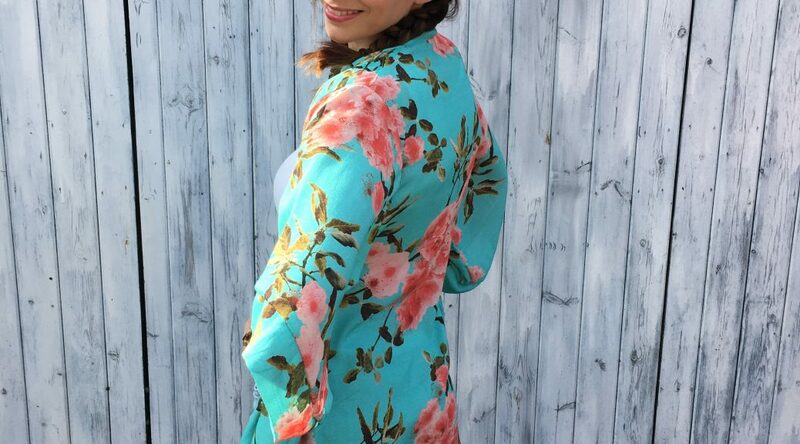 The pattern for June’s Sew My Style Challenge is the Suki Kimono by Helen’s Closet. 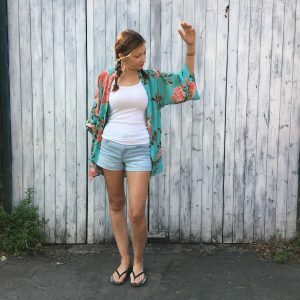 I am really excited to make this pattern, as kimonos are much more chic than a standard cardigan and can add an extra layer to an outfit which still looking stylish. 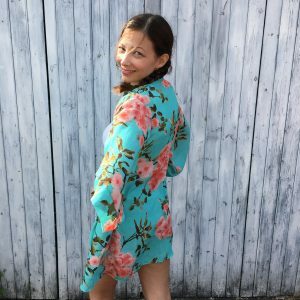 You can of course, make the Suki as a dressing gown, but I love the shorter length for more of a boho festival-chic piece. 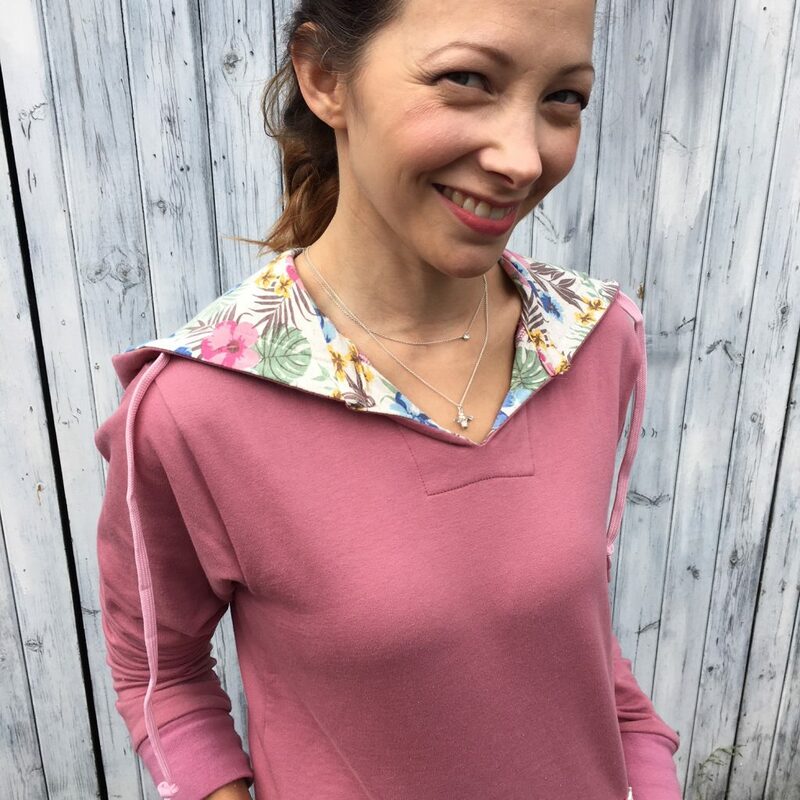 Helen has done an easy hack for making the Suki into a daytime cover up here. Ideally you want to use a drapey fabric with lots of flowy movement, as anything too heavy would be too structured and boxy. 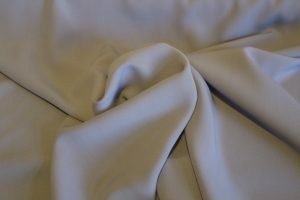 I would recommend a rayon or rayon blend. There are some beautiful florals which would suit the boho vibe perfectly. 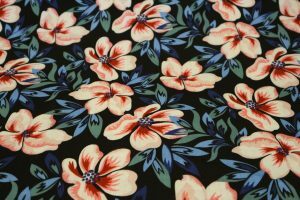 You could also use a lighter weight cotton – a cotton lawn would work well and would be easier to work with, it just wouldn’t have quite the same drape as a rayon. I hope this has given you some inspiration! Let me know if you have any questions.